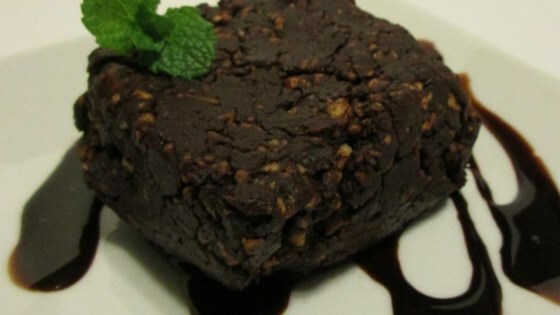 "Fun, quick, and easy to make, this raw brownie recipe is not only healthy for you, but tastes good too." Blend walnuts, almonds, and pecans together in a food processor or blender until powdery; transfer to a bowl. Stir cocoa powder and salt into nut mixture; add dates and vanilla extract. Mix nut-date mixture using your hands, squeezing and mashing dates until mixture becomes the texture of brownie batter. Add water, 1 teaspoon at a time, to batter if needed to moisten. Form batter into desired shape. Use good cocoa powder and, although more expensive, sugar-free organic vanilla extract. Try adding other fun ingredients like coconut and raisins.